Phitsanulok is rarely seen as a vacation highlight, but rather a stop on the way to popular attractions in the north. Eschew the tourist crowds and head to Wat Sorasak and Phra Si Ratana Temple. 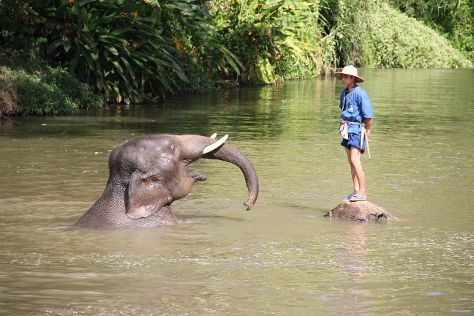 Do some cultural sightseeing at Boon Lott's Elephant Sanctuary and Phra Si Ratana Temple (Wat Yai). Change things up with a short trip to Wat Saphan Hin in Sukhothai (about 34 minutes away). Spend the 25th (Sun) exploring nature at Phu Hin Rong Kla National Park. There's more to do: examine the collection at Sgt. Maj. Thawee Folk Museum and contemplate in the serene atmosphere at Phra Buddha Chinnarat. For photos, traveler tips, reviews, and other tourist information, go to the Phitsanulok trip itinerery planner. The Route module can give you travel options from your home to Phitsanulok. Expect a daytime high around 38°C in September, and nighttime lows around 29°C.